Microsoft is making a preview edition of the new Paint 3D available for download right now if you're a Windows Insider. A mere day after its announcement, you can already test the newest, 3D-obsessed generation of Microsoft Paint—if you’re a Windows Insider, that is. Paint 3D Preview is now available for download for anyone in the Insider program running the latest Windows 10 Insider build. Check out our tutorial on how to join the Windows 10 Insider Program if the ability to play with Paint 3D has you pining for Insider membership. Once your PC is up and running with a Windows 10 Insider build, you can download Paint 3D Preview from the Windows Store. Even though non-Insiders can see Paint 3D in the Windows Store you won’t be able to download and install it—unlike preview Edge extensions. We tried downloading the app on a non-Insider build but the download failed. Microsoft announced Paint 3D on Wednesday as part of the free Windows 10 Creators Update rolling out in Spring 2017. Paint 3D will allow users to integrate 3D and 2D images into a single picture. The idea is for casual users to use the new functionality to create “3D memories” by combining 2D photos with 3D elements, as well as emoji, stickers, and digital pen drawings. 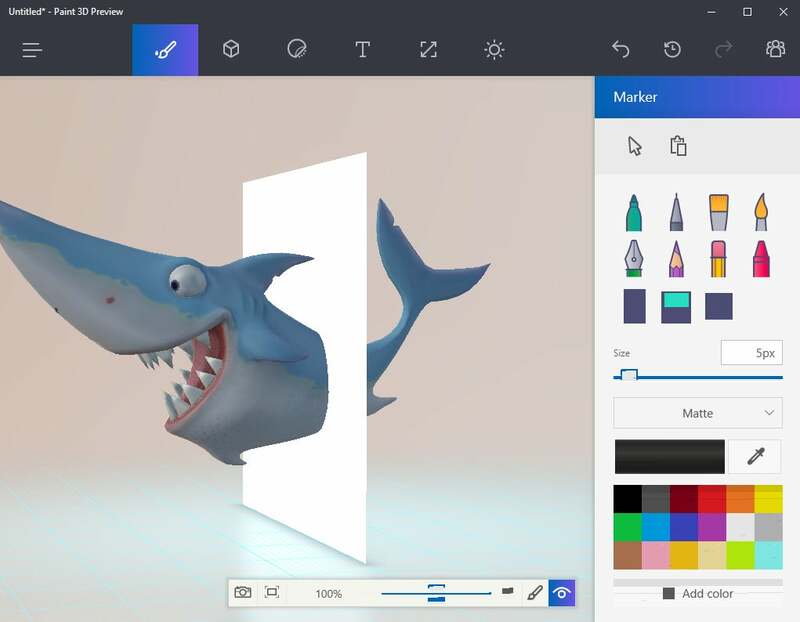 Paint 3D also appears focused on making 3D image editing tools as easy as possible, which is a longtime focus of Paint. We’ll have a better sense of that with our hands-on with Paint 3D coming later on Thursday. Why this matters: Microsoft hopes 3D is going to be a big part of everyone’s computing future. That vision sees us using virtual and augmented reality headsets, or turning to Paint 3D and Microsoft Office to create files with 3D elements for work, school, and fun—then maybe finishing the day creating a few 3D monuments in Minecraft. It’s a big bet on digital worlds, and not-so-coincidentally, Microsoft also announced a wave of $300 Windows 10 VR headsets slated to hit the streets around the same time as the Windows 10 Creators Update.